USSR: The Bolsheviks strike back at Polish forces with a rapid thrust in the Potock area in the Ukraine. Germany: Martin Bormann and Rudolf Höss each receive a prison sentence for the murder of suspected communist Walther Kadow, who was beaten to death as revenge for his part in the arrest and execution of a fellow Nazi. China: The Republic of China establishes the Order of the Precious Tripod, a military award for significant contributions to national security. CBI - China: Day 135 of 142 of the 1st Battle of Hebei. Germany: The new Unified Theatre Law gives the Reich Chamber of Culture the right to dictate the content of what can and cannot be performed. Germany: Workers are banned from changing jobs without official authorization. Spain: Day 303 of 985 of the Spanish Civil War. A government crisis forces Prime Minister Francisco Largo Caballero to resign. Spain: Day 668 of 985 of the Spanish Civil War. CBI - China: Day 313 of 2,987 of the 2nd Sino-Japanese War. Day 98 of 124 of the Battle of Henan. Eastern Front: The Ravensbruck Concentration Camp for women is established. CBI - China: Day 678 of 2,987 of the 2nd Sino-Japanese War. Day 26 of 35 of the Battle of Suizao. Japanese troops are showing signs of weakening from Chinese counter-attacks. CBI - Mongolia: Day 5 of 129 of the Battle of Khalkhin Gol, a border dispute between the Soviet Union and Japan. USA: The very first McDonald's restaurant opens in San Bernardino, California. USA: Women's stockings made of nylon are placed on sale across the United States. Almost five million pairs are bought on this day. UK: British butter rationing is reduced from 8 ounces to 4 ounces per person per week. ETO - UK: Churchill sends a message to President Roosevelt asking for destroyers, fighters, anti-aircraft guns, steel and other war-related materials. ETO - Norway: Day 37 of 63 of the Battle of Norway. ETO: Day 6 of 8 of the Battle of The Netherlands. The Dutch surrender to Germany. The Communist Party of The Netherlands holds a meeting to organize an underground resistance during German occupation. ETO - Belgium: Day 6 of 19 of the Battle of Belgium. The Battle of Gembloux ends with the Germans losing about 250 tanks. However, the weakened French forces are unable to hold the line and fall back toward the Belgian-French border. ETO - France: Day 6 of 44 of the Battle of France. French Prime Minister Reynaud calls Churchill and says, "We are beaten. We have lost the battle." ETO - Germany: The RAF begins a strategic air offensive against targets inside Germany by attacking industrial installations in the Ruhr. CBI - China: Day 1,044 of 2,987 of the 2nd Sino-Japanese War. Day 183 of 381 of the Battle of South Guangxi. Day 15 of 49 of the Battle of Yichang. UK: The first British jet aircraft, the Gloster E.28/39, is flown. USA: President Roosevelt tells Vichy France to choose between Germany and the US. Atlantic: German sub U-105 sinks the British ship BENEVENUE 400 miles off Sierra Leone, British West Africa. 430 miles west of Brest, France, German sub U-43 sinks the French sail NOTRE DAME DU CHATELET. ETO - UK: Day 252 of 258 of the Blitz. ETO - UK: Britain announces that their losses in France and Norway are 13,250 killed and 41,000 captured out of 437,000 deployed. ETO - UK: A false rumor begins to spread saying that Sibyl Mary Hathaway, the Dame of Sark, a small island in the occupied Channel Islands, has been deported to a German concentration camp as reprisal for civil disobedience. ETO - Germany: The RAF night bombs targets at Hanover, Berlin and Cuxhaven. Germany: Dr Sigmund Rascher writes Heinrich Himmler a letter requesting that all concentration camp prisoners be placed at his disposal so he can conduct experiments in decompression chambers which simulate high altitude environments. MTO - Greece: The Luftwaffe begin attacking the Greek island of Crete, sinking the Greek destroyer LEON. MTO - Libya: Day 36 of 256 of the Siege of Tobruk. The British capture Halfaya Pass, Sollum and Fort Capuzzo by noon. In the afternoon, the Germans retake Fort Capuzzo. Middle East: Day 14 of 30 of the Anglo-Iraqi War in Iraq. British bombers again attack French airfields at Palmyra and Damascus, Syria. East Africa: Day 340 of 537 of Italy's East African campaign in the lands south of Egypt. The South African and Indian troops link up at Triangle Hill near Amba Alagi, Abyssinia, and are joined by Abyssinia guerrilla forces. The Allied shelling of the town damages an oil tank, which contaminates the garrison's only source of drinking water. CBI - China: Day 1,409 of 2,987 of the 2nd Sino-Japanese War. Day 9 of 21 of the Battle of South Shanxi. USA: Gasoline rationing goes into effect in the eastern United States. By the end of 1942, half of all US automobiles will be issued an "A" sticker which allows a mere 4 gallons of fuel per week. 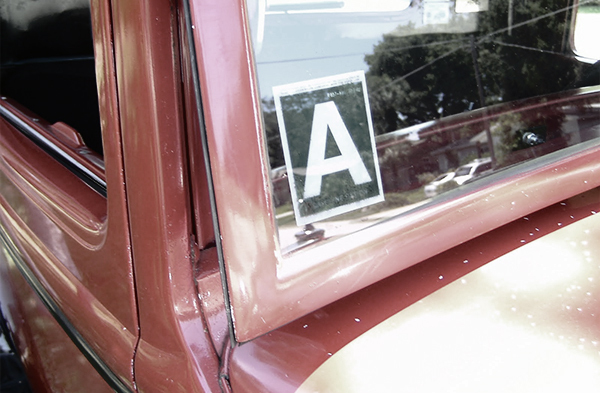 By the end of 1942, half of US automobiles were issued an "A" sticker which allowed 4 gallons of fuel per week. That sticker was issued to owners whose use of their cars was nonessential. Hand the pump jockey your Mileage Ration Book coupons and cash, and she (yes, female service station attendants because the guys were over there) could sell you three or four gallons a week, no more. For nearly a year, A-stickered cars were not to be driven for pleasure at all. The green "B" sticker was for driving deemed essential to the war effort; industrial war workers, for example, could purchase eight gallons a week. Red "C" stickers indicated physicians, ministers, mail carriers and railroad workers. "T" was for truckers, and the rare "X" sticker went to members of Congress and other VIPs. Truckers supplying the population with supplies had a T sticker for unlimited amounts of fuel. "To save tires, drive under 35." The US produced ample supplies of domestic gasoline, but rubber was another matter. The vast majority of the world's supply of rubber was under Japanese control at this time and synthetic rubber production was still in its infancy. 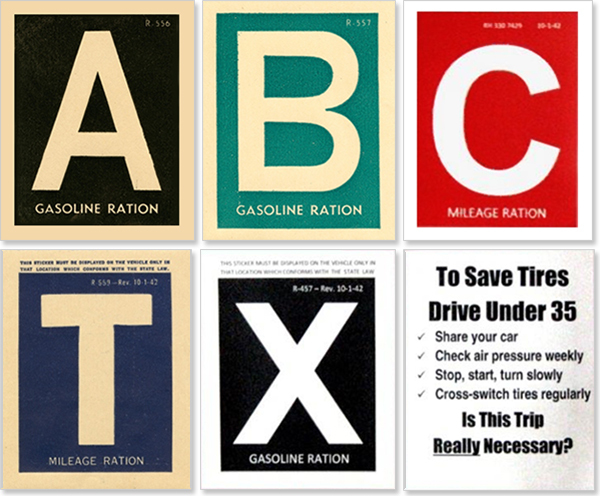 Gas rationing was primarily a measure to conserve rubber for tires. 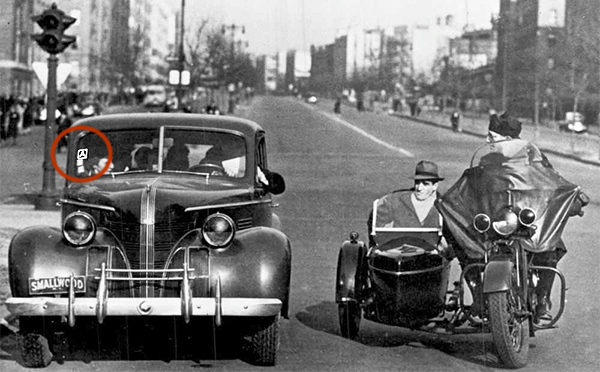 This photo, taken during 1943, shows two government "Gas Snoopers" questioning the operator of the sedan as to why they were even driving. Note the deserted street and the "A" gas rationing sticker on the windshield. USA: The Women's Army Auxiliary Corps (WAAC) is created as an auxiliary unit of the US Army, modeled after the British ATS. Atlantic: Day 122 of 169 of Germany's Second "Happy Time," during which U-boats sink 609 Allied ships with little risk. U-751 sinks the US freighter NICARAO east of the Bahamas. USSR: Soviet test pilot Grigory Bakhchivandii makes the first powered flight in the experimental Berezniak-Isaev BI-1 rocket-powered interceptor at Bilimbay, Sverdlovsk, Russia. Russian Front - North: Day 250 of 872 of the Siege of Leningrad. Russian Front - North: Day 97 of 102 of the Battle of the Demyansk Pocket, another failed attempt to break the siege at Leningrad. Russian Front - North: Day 11 of 658 of the Siege of the Kholm Pocket. Russian Front - South: Day 4 of 17 of the 2nd Battle of Kharkov, Ukraine. The Soviets try to mount another offense but are held. Russian Front - South: Day 198 of 248 of the Siege of Sevastopol, Crimean Peninsula. Russian Front - South: Day 8 of 12 of the Battle of the Kerch Peninsula, Crimea. East Africa: Day 11 of 186 of the Battle of Madagascar. CBI - Burma: Day 153 of 164 of Japan's Invasion of Burma. British troops reach Assam in northeastern India. CBI - China: Day 1,774 of 2,987 of the 2nd Sino-Japanese War. Day 1 of 124 of Japan's Zhejiang-Jiangxi Campaign, launched to punish anyone suspected of aiding the Doolittle raiders in China. Roughly 250,000 Chinese will be killed. PTO - Malaya: Day 86 of 357 of the Battle of Timor Island. Atlantic: A US reconnaissance plane finds German sub U-176 off the coast of Havana, Cuba. The Cuban submarine chaser CS-13 is notified, closes in, and sinks U-176, killing the entire crew. ETO - Germany: US 8th Air Force B-17s bomb targets at Wilhelmshaven, Emden, and Helgoland Island. USSR: Stalin announces the dissolution of the Komintern, the Communist International working for world revolution. Russian Front - North: Day 615 of 872 of the Siege of Leningrad. Russian Front - North: Day 376 of 658 of the Siege of the Kholm Pocket. MTO: The British announce that the passage through the Mediterranean is clear, and convoys from Gibraltar to Alexandria, Egypt, is resumed. MTO - Italy: US 12th Air Force RAF Wellingtons night bomb targets at Palermo. CBI - China: Day 2,139 of 2,987 of the 2nd Sino-Japanese War. Day 4 of 23 of the Battle of West Hubei. Japanese bombers and fighters attack at Kunming but do little damage. PTO - Alaska: Day 343 of 435 of the Battle of Kiska, Aleutian Islands. Day 5 of 20 of the Battle of Attu. US 11th Air Force provides air support. PTO - Marshall Islands: US 7th Air Force B-24s bomb targets on Wake Island. PTO - New Guinea: Day 24 of 148 of the 2nd Battle of Lae-Salamaua. US 5th and 13th Air Forces provide air support. PTO - Philippines: The USS GAR attacks a Japanese convoy sinking the cargo ships MOIKAI MARU and INDUS MARU. ETO - France: US 9th Air Force A-20s and B-26s bomb airfields at Creil and Evreux/Fauville and the marshalling yard at Somain. Germany: The transporting of Hungarian Jews to Auschwitz Concentration Camp begins. Germany: Hans Speidel arranges a meeting between Erwin Rommel and a group of anti-Hitler conspirators, but he never attends such a meeting. Russian Front - North: Day 104 of 191 of the Battle of the Narva Isthmus, Estonia. Both German and Soviet troops remain in their defensive positions. Russian Front - South: Day 38 of 60 of the Battle of Romania, 1st Jassy Offensive. MTO - Italy: Day 120 of 123 of the Battle of Monte Cassino. RAF and US Air Forces provide air support. Day 5 of 8 of Operation DIADEM. German troops begin to withdraw from the Gustav Line to the Hitler Line (aka the Dora Line) 30 miles to the south of Rome. MTO - Italy: Day 115 of 136 of the Battle of Anzio. RAF and US Air Forces provide air support. CBI - Burma: Day 72 of 166 of the UK's Operation THURSDAY. CBI - Burma: Day 67 of 147 of the Battle of Myitkyina. US 10th Air Force provides air support. The Chinese-American-Kachin troops outside of Myitkyina transmit the code phrase "strawberry sundae" to signify that they are in position to strike the Japanese-occupied city. CBI - Burma: Day 45 of 302 of the Chinese Salween Offensive. CBI - China: Day 2,505 of 2,987 of the 2nd Sino-Japanese War. Day 29 of 259 of Japan's Operation ICHI-GO. Day 29 of 39 of the Battle of Central Henan, the first offensive in Japan's Operation ICHI-GO. CBI - India: Day 69 of 118 of the Battle of Imphal-Kohima. Anglo-Indian troops push the Japanese troops out of Potsangbam. The Indian 33rd Brigade captures Treasury Hill. A Japanese attack on Hunter's Hill is repulsed. PTO - New Guinea: Day 77 of 80 of the Battle of the Admiralty Islands. 5th Air Force provides air support. PTO - New Guinea: Day 153 of 597 of the Battle of New Britain. US 13th Air Force provides air support. PTO - New Guinea: Day 24 of 481 of the Battle of Western New Guinea. PTO - Solomon Islands: Day 197 of 295 of the Battle of the Bougainville Islands. US 13th Air Force provides air support. Austria: SS Obersturmbannführer (Lieutenant Colonel) Otto Skorzeny surrenders to Americans at a field headquarters near Salzburg, Austria. Skorzeny was field commander in the Mussolini rescue mission, the leader of the operation that had German soldiers infiltrate Allied lines wearing American uniforms and, at war's end, organizer of the Werwölfe (Werewolves) guerrilla movement and the ODESSA network that helped Nazis escape justice. Yugoslavia: Croatian troops that had surrendered to British forces in Austria are handed over to Yugoslavian partisans, resulting in the murder of over 110,000, including women and children. CBI - Burma: Day 1 of 2 of the Battle of the Malacca Strait. The Royal Navy will sink the Japanese cruiser HAGURO in the Malacca Strait off the Malay Peninsula. CBI - China: Day 2,870 of 2,987 of the 2nd Sino-Japanese War. Day 45 of 91 of the Battle of Zhijiang. US 14th Air Force provides air support. Day 37 of 60 of the Battle of West Hunan (near Zhijiang). Japanese troops continue withdrawing from southern China. PTO - Alaska: US 11th Air Force B-24s bomb the Kashiwabara, Paramushiru Island, Kataoka, and Shimushu Island areas, destroying one ship and damaging another. PTO - Dutch East Indies: Day 15 of 52 of the Battle of Tarakan Island. PTO - Japan: Day 45 of 83 of the Battle of Okinawa. The US 10th Army is now within 2,000 yards of the Naha docks. PTO - New Guinea: Day 505 of 597 of the Battle of New Britain. US 10th Air Force provides air support. Victoria Cross: While fighting at Wewak, Australian Private Ted Kenna exposes himself to Japanese machine guns so his comrades can capture the position without further casualties. PTO - New Guinea: Day 389 of 481 of the Battle of Western New Guinea. US 10th Air Force provides air support. PTO - Philippines: Day 207 of 299 of the 2nd Battle of the Philippines, aka the Liberation of the Philippines or the Philippines Campaign. PTO - Philippines: Day 152 of 244 of the Battle of Luzon. 5th Air Force provides air support. PTO - Philippines: Day 67 of 159 of the Battle of Mindanao Island. 5th Air Force provides air support. PTO - Philippines: Day 59 of 135 of the Battle of the Visayas region. US 5th and 7th Air Forces provide air support.